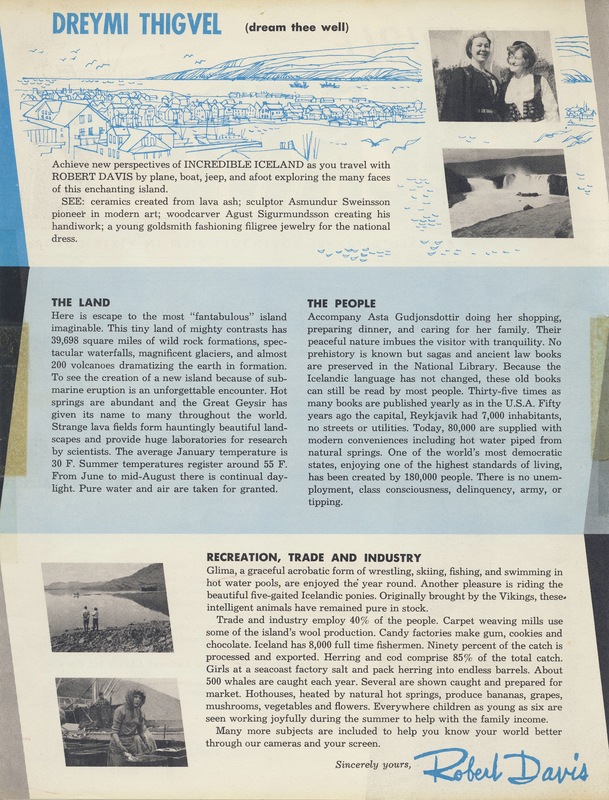 The historical approach taken in “Sodbusters” differentiates the episode from the others in Earthkeeping – the narrative draws a comparison between the pioneer mindset of westward expansion/Manifest Destiny and the sense of entitlement possessed by corporate developers in the twentieth century. How much have modern practices of resource exploitation changed since the days of John Jacob Astor and the American Fur Company? 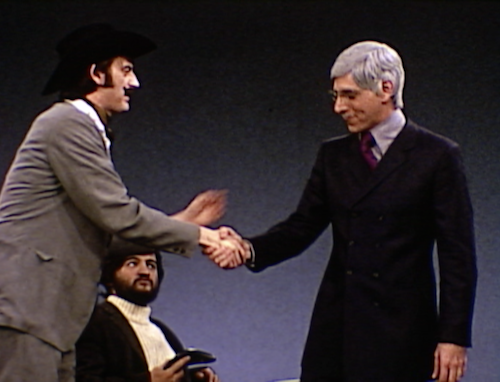 On The Yesterday Show, Robert Trashman (John Belushi) stands up for the environment, squaring off against cowboy star Jack Crabbe (Joe Flaherty) and industrialist C. Steel Mills (Harold Ramis). Last week (March 24-27), CFA hosted University of Alberta associate professor Liz Czach as she conducted research on our Robert & Theresa Davis Collection. 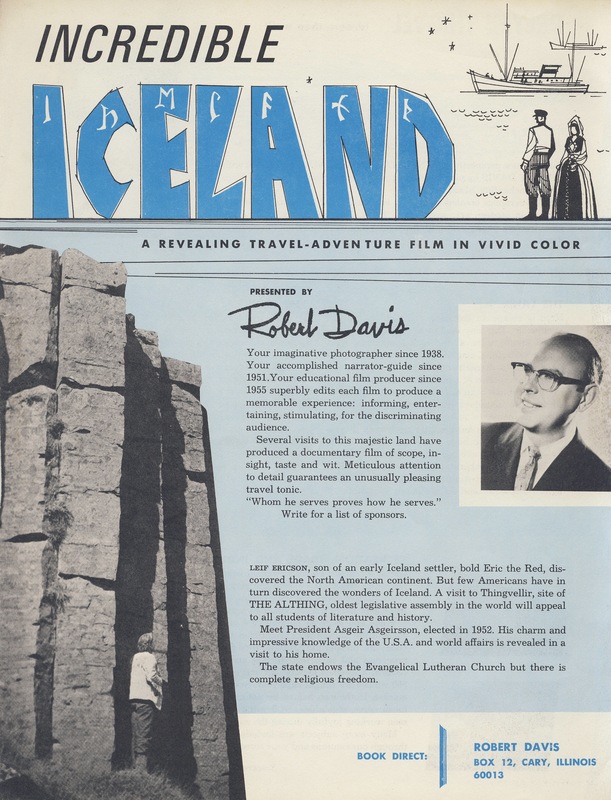 Liz is currently researching a number of travelogue filmmakers, but her particular interest in the Davis Collection stems from its relative completeness – in many instances, archives only hold on to the travelogue films themselves and perhaps a few other relevant artefacts. 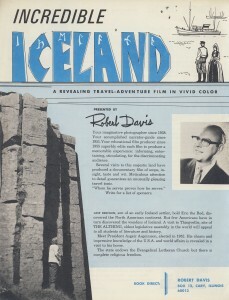 In the case of the Davis Collection, the films are not limited to final prints, but also include outtakes and various other production elements. 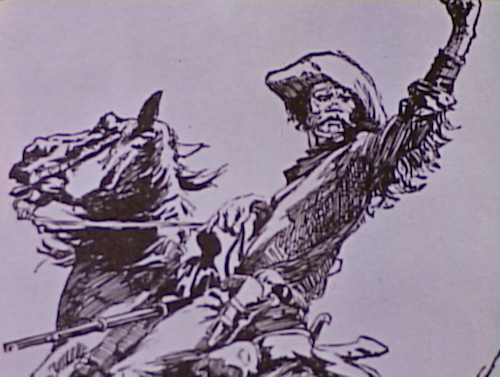 Additionally, large amounts of complementary presentation material, such as ¼ inch audio soundtracks, full narration scripts, and Robert Davis’ personal cue cards, are being preserved along with the films. The collection also includes over twenty boxes of other promotional and personal material. 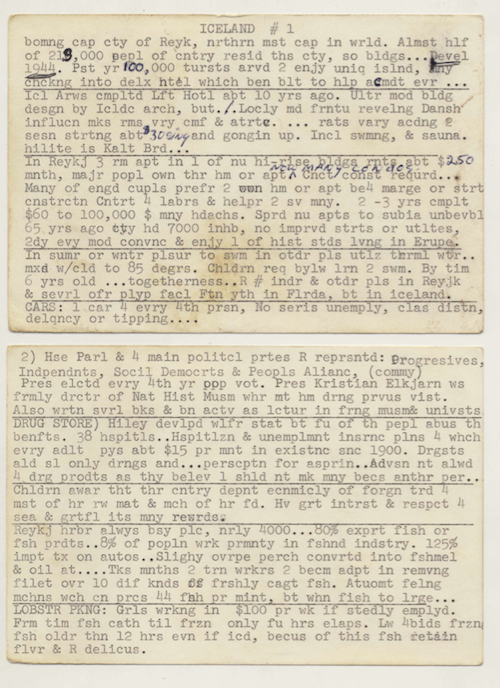 This additional ephemera provides insights not only into the working habits and biographies of Robert & Theresa Davis, but also helps to shed light on the history of the travelogue genre and circuit. 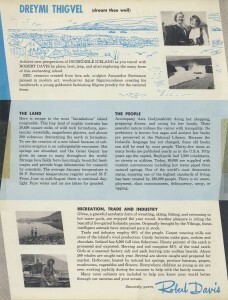 Above: Promotional materials for Incredible Iceland – “Meticulous attention to detail guarantees an unusually pleasing travel tonic.” Click the thumbnails for full-size images. 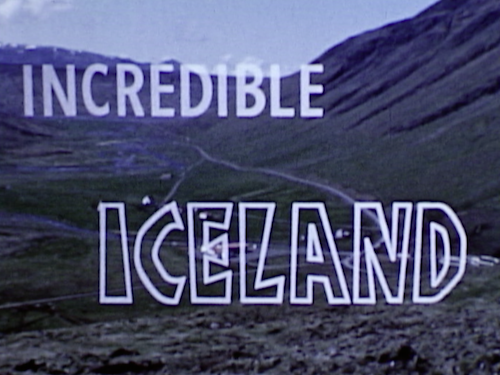 Sound effects employed in the film. PUFFIN EFFECT! 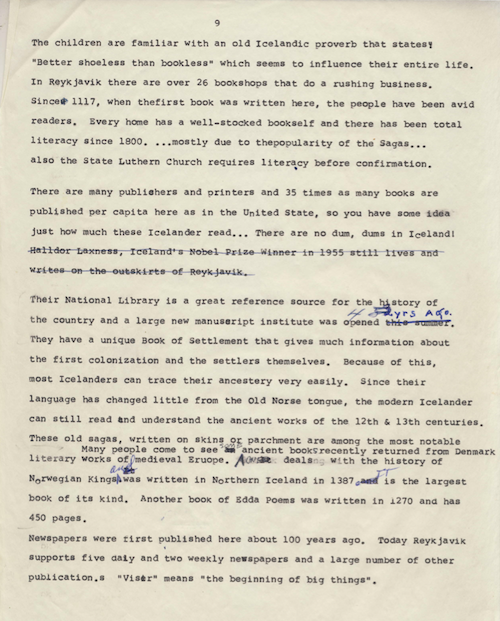 Although the films have been inventoried, neither they nor the paper materials have been processed. Liz’s visit greatly helped to shine a light on what we have on our hands, but there is still a lot of work to be done. 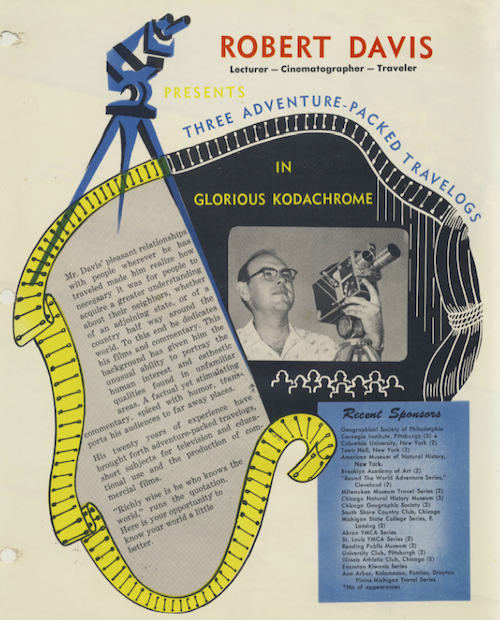 Updates on the Robert & Theresa Davis Collection, including digitized film transfers, biographical information on Bob & Terry, and more on the travelogue genre, will be appearing in the weeks to come. This year, we were fortunate to acquire five more reels of home movies featuring the 1933 Chicago “Century of Progress” World’s Fair. They were shot by Russell V. Zahn (1901-1993) of Racine, Wisconsin and part of a larger collection of home movies donated by the family (you can read more about our Zahn Home Movie Collection here). Previously, we only had two 16mm reels documenting the fair, one in our Ferd Isserman Collection and another in our David Gray Collection. The Isserman film is and reads very much like a home movie, while the Gray film *appears* to be a silent commercially produced film spliced together with home movie footage. I almost prefer the home movie footage over the commercially produced films about the fair. Each home movie gives a unique on-the-ground (and sometimes overhead!) perspective, shaky camera and all. They often highlight family members & friends and even include quiet downtime moments or breaks from the hustle and bustle, giving us 21st century viewers a more personal experience of the fair. These five reels (now streaming on our site and below via CFA’s Youtube channel) are the oldest 8mm films we have and they happen to document one of our favorite subjects in all its troubled splendor. 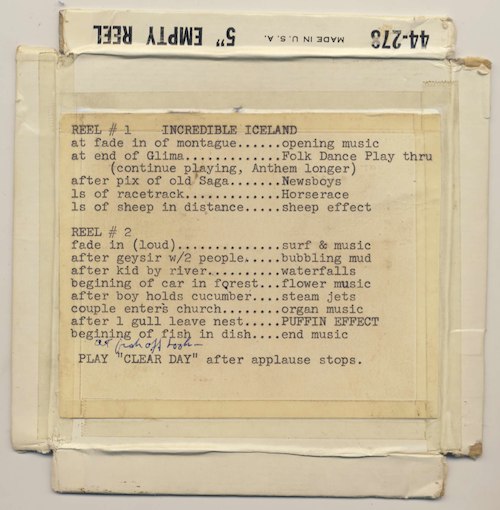 At this time, it’s unclear what order the reels were shot, but we have labeled them Reels 1-5 in order for us to differentiate the titles among reels (all were titled simply “1933 Chicago World’s Fair,” but each contains unique footage). Enjoy!